While Valentine’s Day is mostly associated with romance, it has become more common to celebrate all forms of love. GFWC clubs take the holiday as an opportunity to open their hearts to their communities. 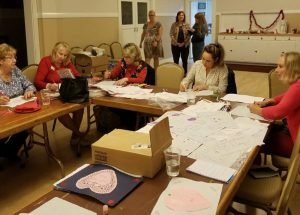 The GFWC Junior Woman’s Club of Jacksonville (Florida) likes to show their love for the troops on Valentine’s Day. This year they made over 200 cards to send with candy! Sharing their enthusiasm is the Newtown Woman’s Club, GFWC, Inc. (Connecticut), who has a long tradition of supporting our country’s veterans. 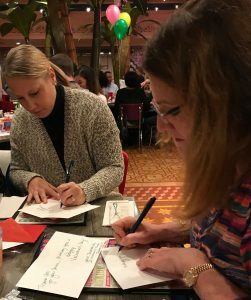 To make the men and women who served our nation have a special holiday, the club write notes and sends them to the veterans living at the state’s retirement home. Retirement homes are a popular spot for GFWC Valentine’s Day projects because they want residents, especially those who don’t have loved ones to spend the day with, to remember they are valued. 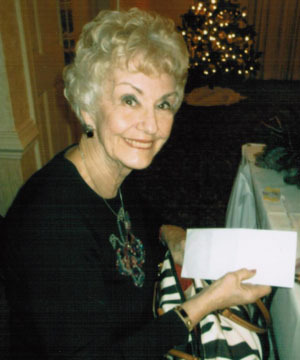 The annual project of the GFWC Woman’s Club of Newton (New Jersey) is to collect valentines made by school children, and deliver the colorful messages to nursing home residents. The GFWC La Cresenta Woman’s Club (California) decorated placemats for seniors at a local retirement home to brighten up their meals this year. Valentine’s Day provides an opportunity to express all kinds of love, even love for your libraries! The GFWC Marlborough Junior Women’s Club (Massachusetts) turned Valentine’s Day into Love Your Library Day in recognition of librarians and GFWC’s history with libraries. For the past seven years, they’ve delivered cards and homemade chocolates for the librarians in two local libraries on Valentine’s Day. The Marlborough Library is less than a block from the homeless shelter, and the librarians have been instrumental in helping them get back on their feet by showing them such things as how to access their Registry of Motor Vehicles accounts. The club knows the librarians do a lot of work helping the less fortunate in their communities, and wanted to show their appreciation. The Valentine’s Day tradition of the GFWC Qui Vive Club (Minnesota) is to deliver the club flower—red carnations— to hospital patients. A card is included with each vase, and the club members enjoy talking with the patients. Unfortunately, due to the severity of the flu this year, the club has to wait and do it closer to Easter. The GFWC Beloit Junior Woman’s Club (Wisconsin) delivers Valentines to patrons of Meals on Wheels. The holiday encourages us to show that we care, and GFWC clubs rise up to the challenge. The creativity and thoughtfulness of all of these projects just goes to show that clubwomen have no shortage of love to share.